Blackberry hasn’t been developing its latest phone, the Passport, in complete secrecy — the Canadian company has been talking about it since last summer. But now the unusually shaped square smartphone is an official product, as Blackberry detailed the device’s features and availability at a launch event in Toronto on Wednesday. According to [company]Blackberry[/company], the square screen is perfect for the kind of tasks businesspeople — Blackberry calls them “mobile professionals” — need their phone to do, like sending emails and editing documents. During the demo, it did look as if the window for composing emails benefits from the wider screen, and Blackberry compared the device to an iPhone that needed to pinch to zoom to edit a text document. Most Blackberry fans will be interested in the hardware keyboard, which has picked up a few new tricks. The keyboard is touch-sensitive, and swiping on it lets you navigate around menus, a lot like the trackball on older Blackberries. Blackberry hasn’t totally eschewed on-screen keyboards, and you’ll find a row of virtual buttons above the hardware keyboard that will provide commonly used symbols, like punctuation and numbers, based on what it looks as if you’re typing. 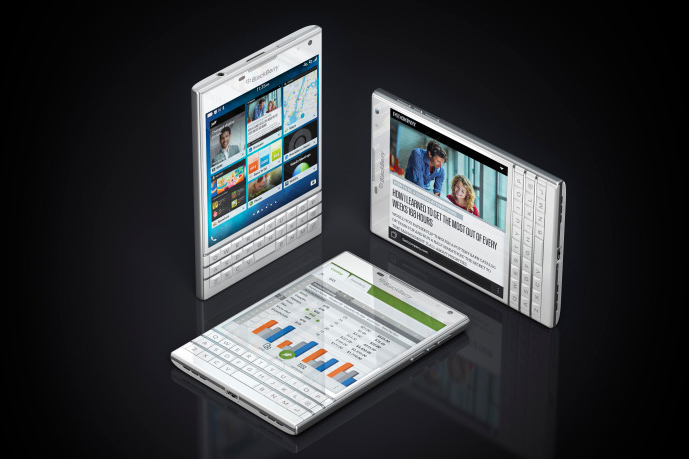 According to Blackberry, users on the Passport keyboard are four times more accurate with 70 percent fewer typos. Blackberry has never been overly concerned with specs, but the Passport isn’t a slouch: It’s powered by a quad-core Qualcomm Snapdragon processor and a big 3450 MAh battery, which Blackberry promises provides 30 hours of email and multimedia use. The Passport also packs 3GB of RAM, 32GB of built-in memory and a 13MP camera, which looks like a huge upgrade from previous Blackberry cameras. Even the 4.5-inch screen is competitive with top-tier Google Android phones and the Apple iPhone, running at 1440 x 1440 resolution, which works out to 453 dots per inch. The Passport will be running Blackberry’s latest operating system, Blackberry 10.3, which has a refreshed look and a few new features, including a voice assistant. One of the major focuses of the software is Blackberry Hub, which brings various feeds, notifications, calendar alerts, and messages into one location. Blackberry Hub isn’t new, and other companies have tried a unified feed before. A more interesting feature is Blackberry Blend, which allows users to read emails, SMS messages, and BBMs on non-Blackberry devices. It also has a few secure file management features. It currently works on Android, Windows, and Mac, and Blackberry says they’re working on porting it to other tablets. It looks a lot like Apple’s still-unreleased Continuity feature, but more focused for business. Blackberry 10 seems to be maturing into a stable and useful OS, especially for IT managers, who will appreciate the updated Blackberry Enterprise Service with tools for managing and securing Blackberry devices as well as corporate Android or iOS phones. Users will appreciate the fact that Blackberry Passport will also have access to Amazon’s app store, which has games and other software that may not come pre-loaded by IT. 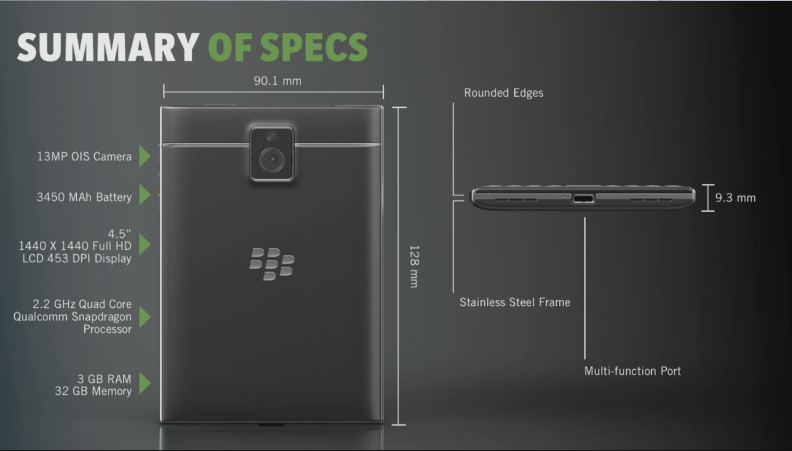 The Passport is Blackberry’s first major device release since CEO John Chen took over late last year. Since then, Chen has reshaped the company and some have questioned the place of devices in the Blackberry’s future. The Passport is a bold device — unlike the Z10, Blackberry isn’t chasing other phone makers anymore. The odd shape of the Passport might be off-putting at first, but the Passport emphasizes what few other devices do: Security, battery life and that classic hardware keyboard. We must appreciate the “never say die” attitude of Blackberry in the event of severe competition & several set backs.